BACKTIME: Since When Do High-Profile Criminal Defendants Do National TV Interviews? Since When Do High-Profile Criminal Defendants Do National TV Interviews? It's the standard "Miranda" warning that we've seen on hundreds of cop shows. And it remains the best advice to any alleged criminal awaiting trial: Just Shut Up. So why would George Zimmerman's attorney, Marc O'Mara, allow his client to speak to anyone while awaiting a trial for murder? The Fox News platform with Sean Hannity may have a more sympathetic audience for Zimmerman to tell his story, but he's facing criminal charges. The court of public opinion has already spoken, and even if it could be swayed by Zimmerman's account, there is absolutely zero to be gained in his criminal defense. It only gave him a chance to contadict his earlier statements and further infuriate the nation that he had "no regrets" and it was "all God's plan" that an unarmed 17-year old was shot and killed. Anyone that knows me could rightfully assume that Backtime's editorial department is no fan of Sean Hannity. But this was a very credible and competent interview. An interviewer's job is to ask open-ended questions and elicit new information from the subject, not to spotlight his/her own theories. If Hannity appeared to be a friend, it only made Zimmerman wore comfortable and talkative. I believe Hannity did a much better job than Larry King or Chris Matthews or Barbara Walters would have in the same situation. And O'Mara did Zimmerman no favors by letting him ramble off-script. You'd think he would have learned something from the events of November 14, 2011. 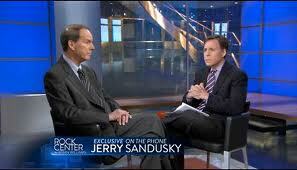 On NBC's Rock Center that night, Bob Costas was scheduled to interview Jerry Sandusky's attorney Joe Amendola. Sandusky had been arrested just over a week earlier, and Joe Paterno had been fired just a few days after that. In a blockbuster twist, right before air, Amendola offered up a phone interview of Sandusky. It was the first of several head-scratching moves by Amendola. 19:00:28:00 But isn't what you're just describing the classic MO of many pedophiles? And that is that they gain the trust of young people, they don't necessarily abuse every young person. There were hundreds, if not thousands of young boys you came into contact with, but there are allegations that at least eight of them were victimized. Many people believe there are more to come. So it's entirely possible that you could've helped young boy A in some way that was not objectionable while horribly taking advantage of young boy B, C, D, and E. Isn't that possible? 19:01:01:00 Well — you might think that. I don't know. (LAUGHS) In terms of — my relationship with so many, many young people. I would — I would guess that there are many young people who would come forward. Many more young people who would come forward and say that my methods and — and what I had done for them made a very positive impact on their life. And I didn't go around seeking out every young person for sexual needs that I've helped. There are many that I didn't have — I hardly had any contact with who I have helped in many, many ways. And I didn't go around seeking out every young person for sexual needs that I've helped. There are many that I didn't have — I hardly had any contact with who I have helped in many, many ways. So Jerry Sandusky "helped" a number of young people, but selectively chose which ones would fulfill his sexual needs. His own words in an unnecessary TV interview helped put him away. Maybe we should be thankful that Zimmerman and Sandusky have received such poor legal counsel, as we watch these words create a web they can't spin out of. But it's the unparalleled stupidity of these attorneys that make us very uneasy about the profession itself. Are they using their clients to make a name for themselves? Even if that was the case, who would hire them after these fiascos? Game Of Thrones: A Kingdom Rises in the West? Breaking Bad: Back To Business?